This section gives you an aerial view of the Geelong region, with all of the railway locations of interest overlaid upon it. For each location, a coloured marker is provided. Clicking on this marker will display the name of the location, a short run down of the available data, and a link to the full history page. 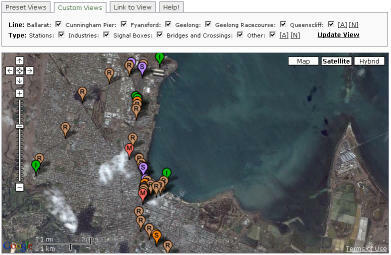 Use the 'Location Types' and 'Rail Lines' tab to change what locations are shown on the map. Both the railways lines the location belongs to, as well as the type of location, can be changed. Click the 'Update' link to apply your changes to the map. Installed Popup Blockers may prevent the satellite map window from appearing. Click on the red "Something should have popped..." bar that appears to open the window manually. Users on slower (eg: non broadband) internet connections may find this section very slow to load, this is due to the large number of images being downloaded for viewing. Switching to the 'Map" display option in the top corner may speed loading times. Other than than you will just need to be patient. For users still not able to use this feature, all location histories are still accessible via the links in the sidebar.